The summer of discontent — well, that’s what it seems to be from the perspective of the not-so-new web darlings — might be coming to an end, but months (perhaps years) of misery awaits these erstwhile rocket ships. The news reports of late have reserved particular vitriol for Groupon (s GRPN), the company that has seen its market valuation decline almost 82 percent since its went public. Over the weekend, The New York Times columnist James Stewart blamed network effects going into reverse for the declining fortunes of the new web companies, though I don’t think his argument applies to Groupon, which has its own unique set of challenges and isn’t in the same class of companies as Facebook (s fb). Today, Wall Street Journal reports that investors like Kleiner Perkins and T. Rowe Price have taken it on the chin with their Groupon investment, but for now they remain believers in Andrew Mason and rest of the team. Nevertheless, the company kept getting valued at nosebleed valuations by private investors. Some of the smartest people on the planet were extolling virtues of the company. Google offered to buy if for $6 billion. Maybe I was too old fashioned to label the company as a “technology company.” So, I abstained from writing and tuned out GroupOn. That didn’t stop the company from going public and getting valued at around $12.8 billion, making it the biggest U.S. web IPO since Google. Nothing really changed after the IPO. The more time went by, the more evident it became, at least to me, that Groupon was no technology company. That is the most crucial point of the Groupon saga. Of course, the problem with Groupon is not entirely of its making. In order for a company like Groupon to get valuations befitting a high-growth technology company instead of a coupon-clipper business, there need to be compliant and willing investors. Many have their own personal compulsions. Kleiner Perkins, having lost its shirt on clean tech and energy investments, decided to double down on social and web investments — price be damned. No one can fault them trying to remake their franchise, which as PE Hub’s Connie Loizos pointed out has been under attack from Marc Andreessen’s investment outfit, A16z. Other late-stage investors in the company felt the heat from late stage investor DST Global, a relatively new and aggressive investor with faint regard for valuation. For others, it was merely a way to play the momentum, make a quick buck and show a win, so that they can go on and raise yet another big fund. Many of these late-stage investors were trying to time the market. And as someone really smart once said — you can’t really time the market. More importantly, it doesn’t matter who you are or how fast you grow, at some point in time companies — both big and small — have to grow into their valuation. Groupon’s late stage investors are living through that harsh reality. If it quacks like a duck…. Groupon isn’t the only company that uses technology but isn’t really a technology company, nonetheless enjoying investors’ decision to value it as a technology company. Just because a company uses the web and uses social networks (instead of real estate and old media) to sell things and find new audiences doesn’t mean that it should be put in the same bucket as, say, a company offering storage services to large companies, or even running world’s biggest social identity platform. Andreessen once famously said that software will eat everything. I totally agree — but that also means that the software should make things more efficient. That makes the companies that are using software to replace the physical infrastructure (and its limitations) more profitable. Yes, the Internet, mobile devices and social networks make it easy for these companies to grow their businesses — really really fast — but at the end of the day, if you are selling shoes, you are selling shoes. If anything, the higher growth, efficiency of infrastructure and ability to narrowly and rightfully target your customers should mean that you as a business should have higher margins than a competitive retailer. And if you do, then you should be valued higher than an offline competitor. However, we continue to see the online-equivalents of retailers and fashion brands being accorded valuations typically reserved for high-growth technology companies. How is a company selling subscription for shoes or underwear a technology company? Many of these online companies might seem special because of there new models, but in the end they aren’t. Like ShoeDazzle that started the whole retail-as-a-subscription madness and is now selling discounted shoes, Groupon is a rude reminder of that reality. The fact is that the very idea of what is a technology company is starting to morph. The traditional tools of valuing technology startups might not be applicable to companies like Groupon, which are like shooting stars – they grow fast and they fade faster. It means, the venture investors have to go back to the drawing board and figure out how to value the online equivalents of old-line businesses. i wonder if there really is a technology company other than ones that make software or hardware. Microsoft’s, CISCO’s and Oracle’s can be technology companies. However Google’s, AOL’s (first an ISP and now a content co.), Yahoo’s, Facebook’s, Zynga’s, Groupon’s and salesforce.com’s are really businesses/ business models that took the offline model online and used “TECHNOLOGY” as an enabler. This is a superficial story that makes me think you don\â€™t understand who Groupon is. Is this what passes for journalism these days? Maybe try talking to some people who know Groupon? Maybe try doing some investigation? Nice article. Of course Groupon’s not a technology company. Neither were about 90% of the old internet-bubble companies. They were retailers with a technology front end (instead of a terrestrial one). Only a few survived, for reasons we now understand. Yet at the time, investors chose to ignore basic business logic – you’re supposed to make a profit, and marketing costs back then were just way too high for most pure-plays, while barriers to entry were way too low. So it is with Groupon. Those of us who follow retail knew from the beginning this one was a pig in a poke. Same story – zero barriers to entry (technology to send emails and manage lists is pretty common now), high marketing costs (or maybe just cost of sales), hard to differentiate – at the end of the day, Fab and Gilte Group have found way better niches – there just was no there there. Having said that, physical infrastructure can also be a limitation as the reach is physically limited to a certain area. Walmart is still struggling with its Asian expansion whereas the likes of Zangya, Facebook, Groupon etc… already have strong international reach. A very nice article indeed Om. I think, you are absolutely right on Groupon being wrongly valued as a technology venture. The reason for that is that it is very very difficult to scale. Groupon Sales staff needs to keep on identifying new deals every single day for the business to sustain. So, it is not non-linear in terms of the revenue growth. The revenue growth will grow with the number of deals on offer rather than the number of customers (which can, however, grow in a non-linear manner). A true technology venture is a company like Facebook where the revenue growth is non-linear (not proportional to growth in number of people). It was valued as a tech company simply because it had a business model senior execs outside of the tech sector and potential investors could understand. This analysis is right on the money. Tech company or not ,Groupon valuation by many analysts’ account is $3 billion not the insanely almost $13 billions. Groupon should have taken Google’s offer of $6 billions; as my pal, Bugs Bunny says: what a bunch of maroons. Whoops, commented too soon. I struggle a little with what it means to be a technology company. On the one hand FB/ZNGA/GOOG are engineering heavy orgs, but it’s not a terrible stretch to say that if Groupon is a better coupon company, FB/LNKD are just better directory lists that are broken out and easy to market to. The question is does scale matter, and I think in the case of all of them, it does. In Groupons case though you need sales people to scale and not just technology, it isn’t hands-off. Are facebook and linkedin directory companies? I agree with the author that certain companies have received valuations out of line with their business models, but I feel that he focuses too much on the word “technology”. The real question should be the viability and attractiveness of a company’s business, meaning its feasible rate of growth (as dictated by market size, the company’s value proposition, and the company’s ability to execute) , return on invested capital, and the sustainability of the business against current and future competitors. Barriers to entry obviously have a big impact on both return on capital and sustainability, and one of the fundamental reasons that I wouldn’t attach a huge multiple to Groupon’s business is that it is fundamentally a local business with fairly low barriers to entry. That said, there are businesses that are truly “technology” businesses that are large but relatively mature- e.g,, Intel, Oracle, IBM, etc. – and are quite valuable in absolute terms, though not high multiple businesses. Again, an indication to focus less on terminology and more on the attributes of a company’s business model. Facebook isn’t in the same class of companies as Facebook. 1.Is it coz Amazon sells/sold the right ideas at the right time? 2.Is this just a trough of disillusionment? 3.Is Groupon failing to innovate? I’m not sure I understand the need to differentiate the idea of a company being a “technology” company, and the resultant value placed upon it as compared to a ‘traditional’ company. Groupon – even before its IPO, and subsequent stock decline – had lofty valuations placed upon it due to REAL revenues, and possible margins. Profit wasn’t nearly as much as could be due to the company sharply accelerating growth/etc around the world, and increasing head count by leaps and bounds. This idea that it was “valued” like a technology company is both perplexing, and dead accurate at the same time. Perplexing because of the notion that technology companies deserve higher valuations just by virtue of their core competency being technology. Accurate because technology companies are the only ones in the world where profits, and revenue, and actual financial data are routinely disregarded for a throw a dart at the wall approach. As a technology company it almost benefits you to have no real revenues to speak of, and let the pundits and bloggers throw out any number that sounds good, and say they’ll grow into it. Companies like foursquare, and even Twitter whom have had years to show even a modicum of ability to generate revenue with such a HUGE user base are given passes, while companies like Groupon whom actually make money from day one are scoffed at, and ridiculed. Companies like Facebook are given absurd valuations based off of pie-in-the-sky projections, and when everyone finds out its hard to monetize a billion freeloaders they act shocked. Om Malik has some good points in this article in which he looks at companies like Groupon that hold themselves out a technology companies whose business model and valuation (and value proposition) are not really in line with true tech companies. It is important for investors and the companies themselves to understand this the distinction between a technology company and a company that provides not technology products/services using the web or social networks as their sales pipeline. Otherwise one or both can have a rude awakening when their results (in terms of growth, development, and valuation) do no meet expectations. Hi Om, nice post. just curious you did not respond to some of earlier comments about Amazon’s evaluation. Interested to know you opinion. An astute comment! Groupon uses sales agents to accomplish a mechanical Turk like service. The comparison to Amazon is equally insightful, because Amazon is actually data driven and customer supported. Quite the opposite! From day one, I recognized that a data service would surpasse such a system, but it doesn’t really exist either. Facebook, like Yahoo and AOL before it, is not a technology company either. It is a media company. Sure, it uses new technology to produce and distribute its content, but capturing and broadcasting video for television once involved new technology as well. You are only a technology company if your success depends on constantly pushing technological boundaries. The likes of Wal-Mart and FedEx (whose success depends on constantly pushing the boundaries of logistics technologies) are much more technology companies than most entrepreneurship in Internet-mediated services. I would respectfully disagree – their front end product is digital media – a new kind of media if you may – but it still has a technology underpinning and has an identity system. I think before the Platform and Facebook Connect you could argue that they were much like MySpace and hence less of a technology company, but since then they have become increasingly important as a “glue” and “login” for many apps, at least for now. That puts them in the same class of technology companies as Google. GroupOn was an email miner for the longest time. Good point! I stand corrected. Their claim to fame was…..mining? email lists? A paleoartifact from the 90s? >That makes the companies that are using software to replace the physical infrastructure (and its limitations) more profitable. Wal-Mart is more profitable than Amazon, even after a decade of growth. How much longer do its shareholders have to wait for the abnormal returns the analysts and VCs were enthusing about in 1999? Any thoughts on Pricleine vs. Boeing? Is Priceline a technology company? very interesting article om but I tend to disagree regarding groupon: they are a local marketplace like ebay – they just happen to sell vouchers. they are not a traditional retailers (don’t carry inventory) and don’t sell goods you can easily find elsewhere at similar or lower price. It does not make groupon a better Company – but its problem is its market and its business practices not its lack of technological prowess. it’s funny to see that ebay, craigslist and groupon are the most successful marketplaces and are not really perceived as tech powerhouses – they are not the fiercest product innovator for sure! None of the 6 stocks I sampled (P, YELP, ZYNGA, GRPN, LNKD, FB) crossed their IPO price. So there is a macro effect here as well. These 6 guys raised $18B on IPO day and now those folks have lost 50% of it (in 6-12 month). 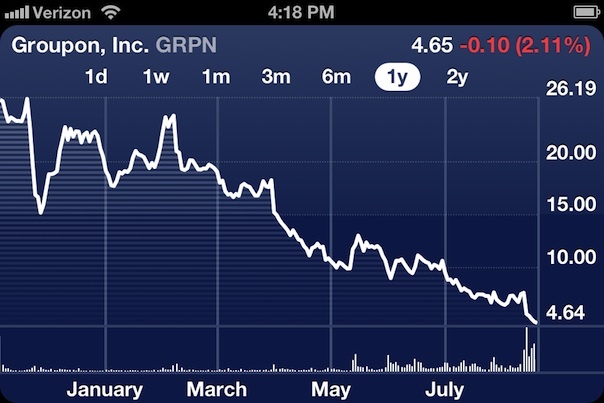 In the case of GRPN, I am sure the slide would have been less if the economy is doing far worse (i.e their model is favourable in recessionary trends). The interesting thing is the fallout from Web 1.0, we are left with GOOG, AMZN, EBAY. I wonder who will be around by 2020 in this crowd. I hope LNKD can grow to be like AMZN. Thanks for the comment. I am not sure the economy had anything to do with it. There is a celing to how much money people can spend, how many deals people can consume and essentially make a go of it. Om, I remember your hyper bullish evaluation of facebook at the IPO price of $38. I had even written a comment asking whether your owned any facebook stock. What do you think of facebook’s stock now? If I remember correctly that your comment was about five links I shared about Facebook. Yeah, you might read it as hyper bullish but to me they were interesting and well written posts. As for owning stock – i only own one stock – GigaOM stock. It is good for me. As far as Facebook stock – well, the market is saying what it is worth. Nice post. Would you care to substitute “viable” for “tech”? Great post, OM – generally agree but would take a more differentiated approach re the valuations of online retailers – if they are vertically integrated like ShoeDazzle, WarbyParker, Indochino, Julep or Chloe & Isabel, they usually have a differentiated position in the market b/c of unique products and enjoy a higher gross margin as they control manufacturing. Those companies are very different to an online retailer that is simply selling the same product I can get offline through an online channel. They might still not be tech companies but generally have a much more interesting value proposition. Thanks. Also, appreciate your comment. Good points. The argument I make is that if they have a higher margin, they should get a higher valuation – to their peers in the same retail businesses. To value them as technology businesses doesn’t make sense – at least to me. Amazon is not much different. Online retail for the most part. Sure they have other tech businesses, but their online retail is a WalMart on the internet. Grossly overvalued IMO too. Razor thin margins. Om, what do you think of Amazon and its valuation? Does the fact that a small chunk of its business is selling cloud services mean that it deserves an agressive tech company multiple?